This is a new arrival from Matta Grosso, Brazil … a very special quartz that has been absent from the market for years … the Super Eight! Super Eight is a mixture of amethyst, cacoxenite, clear quartz, hematite, strengite, beraunite, rockbridgeite and limonite, most of which are various phosphates of iron. Unlike the Super Seven (or Melody Stone), these are not really visible but are present “by solution” when the quartz was molten and before it crystalized. 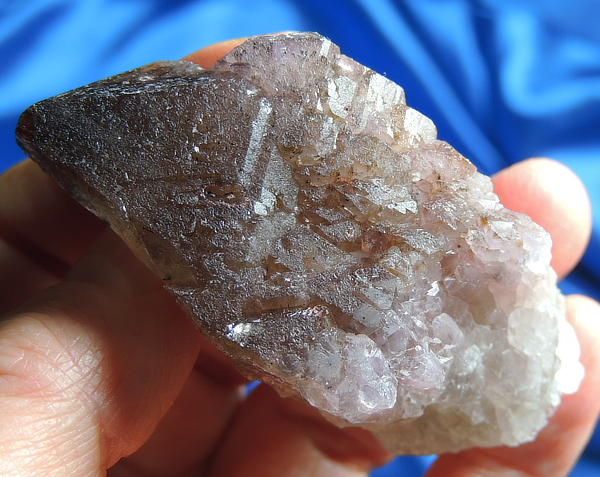 This enticing and special Spirit weighs 2.1 oz and is 2.5” by 1.4” by 1.1” and at first looks a bit like the indigo quartz or Auralite. The amethyst is blushed and the crown that is riddled with glyphs, multiple terminations and trigonic record keepers. Strongly backlight her and you will see a rich and deep golden brown that varies in hue and permeates through the interior of the crystal with the hematite showing the red at the very case! There are keys all around that keys reveal Lemurian lines and subtle starbrary glyphs in bas relief … marks from the crystals that once resided beside her. And for a special effect, she has starbursts of cacoxinite inside! She has a few teeny dings and a back contact area and is in excellent condition … and is utterly and simply stunning! Super Eight quartz is often called the Harmonic Stone. I wasn’t sure about that when I first worked with her. She was buzzy and electric for about 15 minutes, and then it quelled into a peaceful, pulsing wave seemed to enter my toes and exit the Crown … I didn’t want to put her down! Music/sound comes in waves, light comes in waves, heat comes in waves and all three are energy. All my Chakras felt aligned and wonderfully energized. After my meditation, I felt relaxed, peaceful and energized … it was a wonderful experience. I can see her being a wonderful benefit to any crystal/Reiki healing practice, but personal meditation seems to be her forte … she bonds quickly to a special Keeper and would not want to be far from this Keeper. She is a wondrous and special companion!